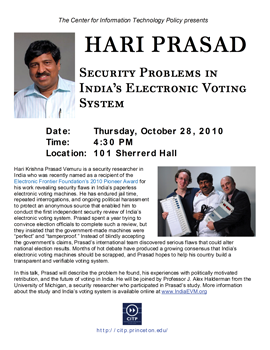 Hari Krishna Prasad Vemuru is a security researcher in India who was recently named as a recipient of the Electronic Frontier Foundation’s 2010 Pioneer Award for his work revealing security flaws in India’s paperless electronic voting machines. He has endured jail time, repeated interrogations, and ongoing political harassment to protect an anonymous source that enabled him to conduct the first independent security review of India’s electronic voting system. Prasad spent a year trying to convince election officials to complete such a review, but they insisted that the government-made machines were “perfect” and “tamperproof.” Instead of blindly accepting the government’s claims, Prasad’s international team discovered serious flaws that could alter national election results. Months of hot debate have produced a growing consensus that India’s electronic voting machines should be scrapped, and Prasad hopes to help his country build a transparent and verifiable voting system. In this talk, Prasad will describe the problem he found, his experiences with politically motivated retribution, and the future of voting in India. He will be joined by Professor J. Alex Halderman from the University of Michigan, a security researcher who participated in Prasad’s study. More information about the study and India’s voting system is available online at www.IndiaEVM.org.